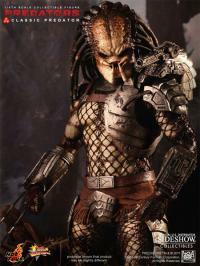 Predator 2 TM & (c) 2011 Twentieth Century Fox Film Corporation. All rights reserved. Predators TM & (c) 2010 Twentieth Century Fox Film Corporation. All rights reserved. 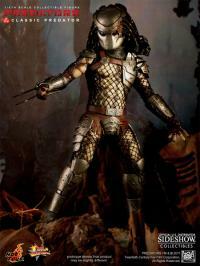 Awesome figure, love the accessories, LED Mask, LED hollogram and real metal blades really make this figure a must have! 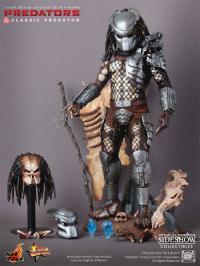 Absolutely must have for any Predator fan! Let me tell you,I'm very hard to please ,I'm very picky about quality and this guy doesn't disappoint ! 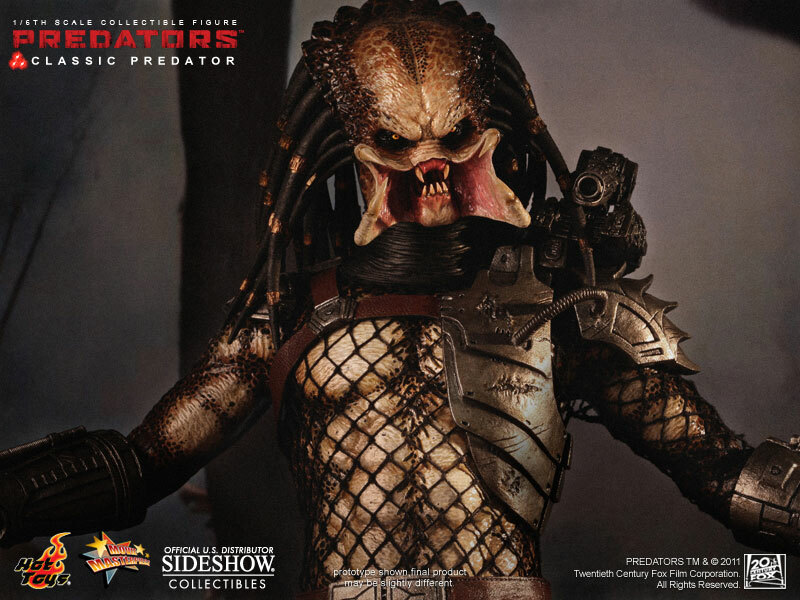 Even my wife ,who wouldn't care less about action figures admires how "UGLY" this guy is. Pick him up ,if you already didn't so! 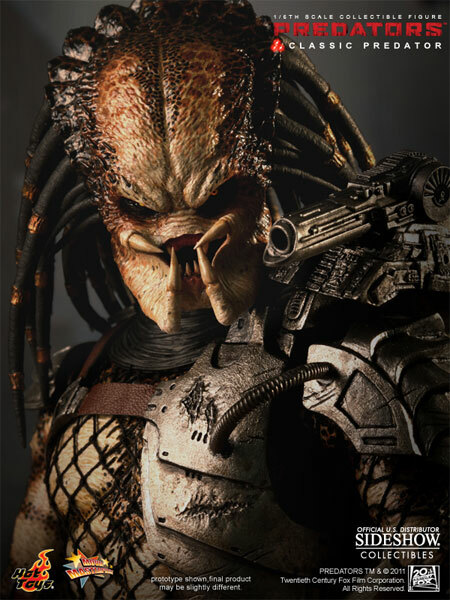 Brought back memories, it's an amazing classic predator. Hot Toys has sold me on this line of Predator Figure's. 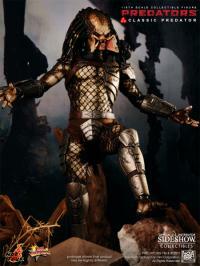 This is the first of the Predator Figure's I own. Now, I won't go without these figure's. Very IMPRESSED with the Detail and size. 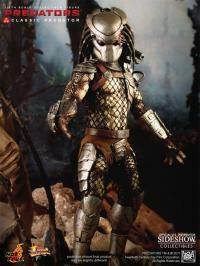 Bring on the 1/4 Scale Line of Predator's!!!! I always regreted not getting the original 1987 Predator figure but now that this came out I'm even happier!!!!!! Absolute 5 Star product, I did'nt know that it would be so big and amazing! 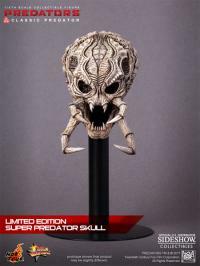 All I can say is it is truly worthy of any Predator collection out there! I am glad I am one of the lucky ones that has this. Thank you Sideshow/Hot Toys again for being on par with your customers! 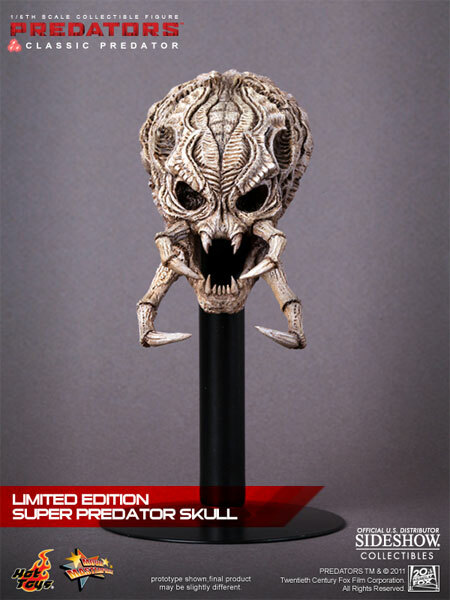 the the predator skull was so awesome i had to buy 2 of them. I just opened the box today and the level of detail is outstanding. Even the packaging is great. The images cannot depict the level of detail this collectible has. 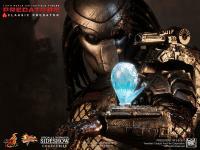 A must have for any collector! Looks good wouldn't give mine up! I received this bad boy yesterday and let me just say WOW! 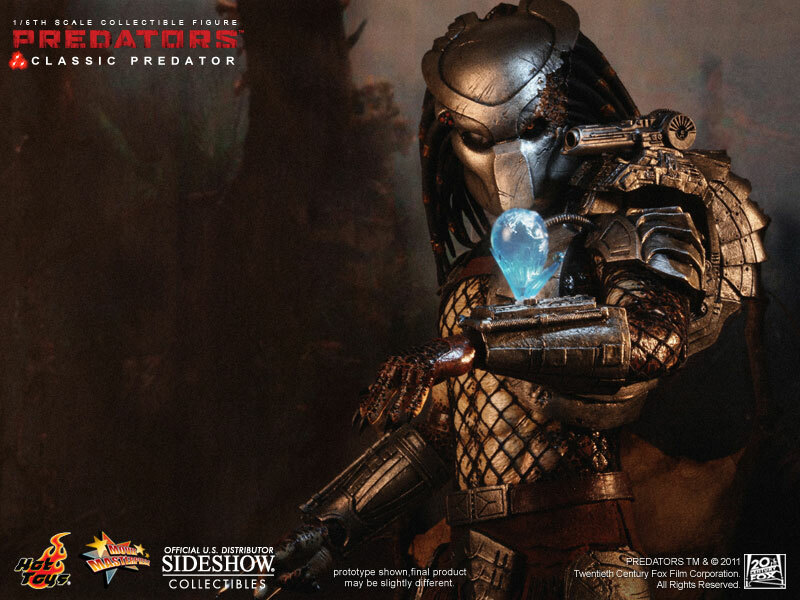 This is my first Predator figure and it was sooooo worth the wait. This big fella looks outstanding from head to toe. Good articulation and accessories. But my fave is the metal retractable claws. DO NOT miss out on this one!!! 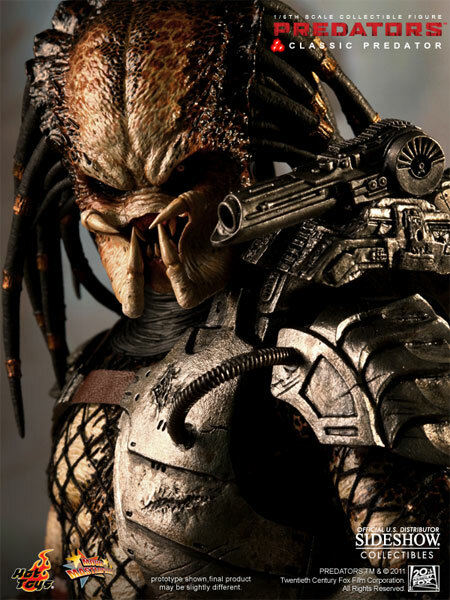 Loving the Predator. 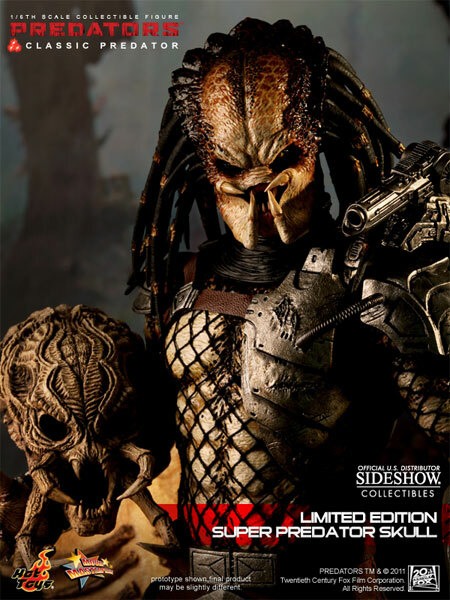 Thanks sideshow. 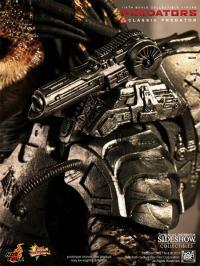 Looks AMAZING!, 5/5. Classic is the way to go! This is the best predator hot toys have made by a mile, overall detail especially his head sculpt is awesome, this definately the predator to get. 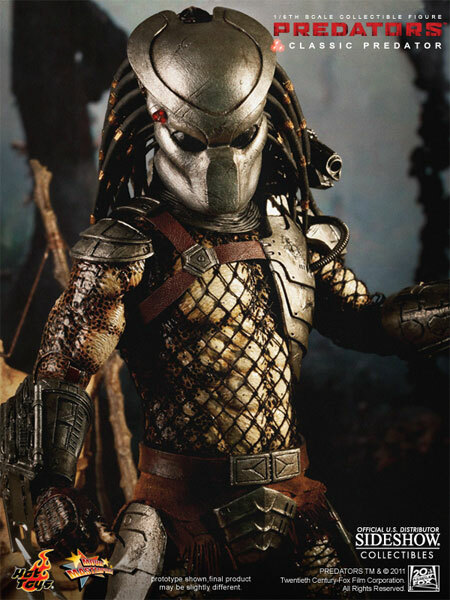 this figure looks badass and ready for hunt. 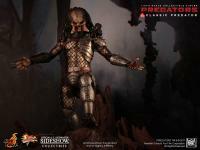 amazing face and body sculpt, this figure is prizeless!!! This figure looks like I thought it would. The size is wright on and the headsculpt is super. I will try to get the shadow too. 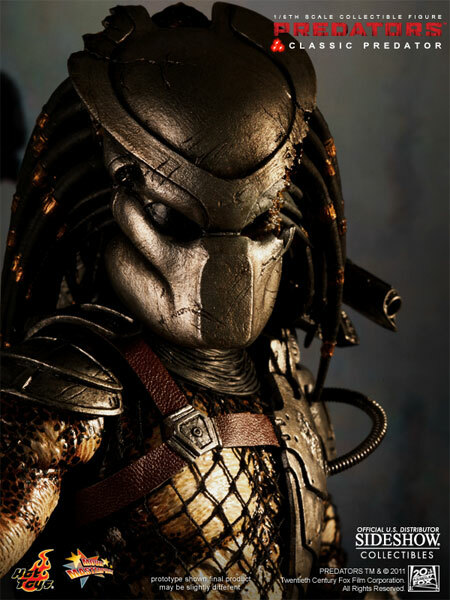 The proportions of the body and head are great! 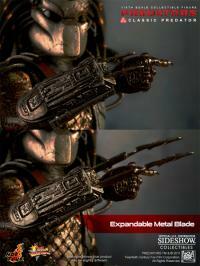 crazy attention to detail,well worth waiting for,packed with extras....every predator fan should own one. 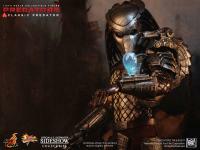 Best predator yet by hot toys.loving the battle damaged bio look....bring on the new avp pred's now! You Can't Beat a Classic!! 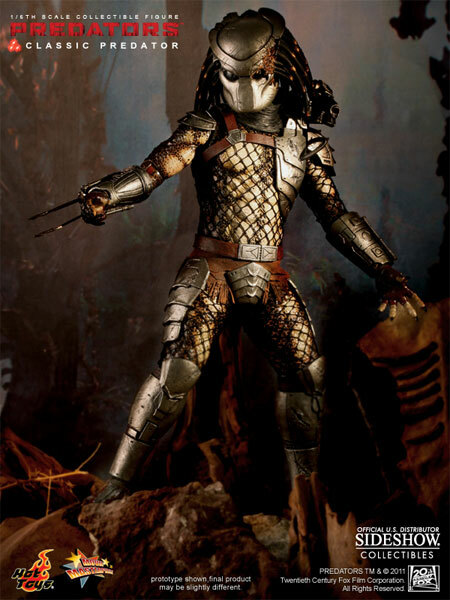 I have seen The Guardian piece and it's great...but this one is so classic that it is my favorite Predator 1/6 Scale Figure. 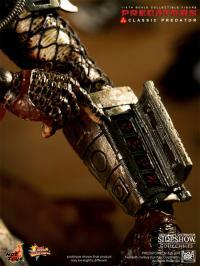 Hot Toys has simply outdone themselves with this version. 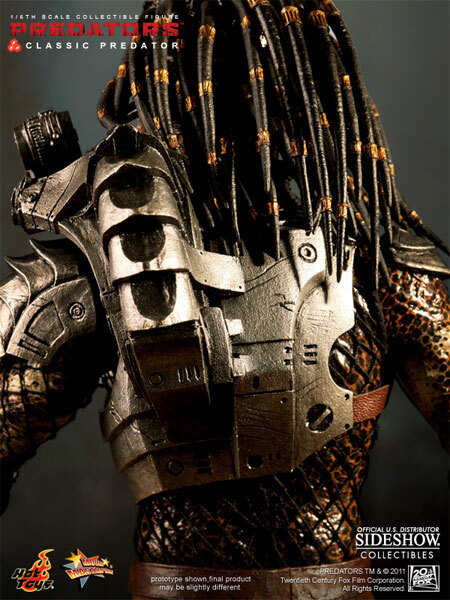 The detail is sick and I think it will be the best in the Predator Series. Just Excellent!! 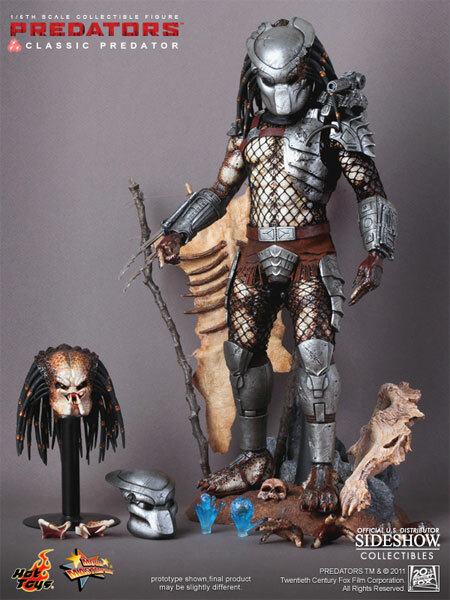 truly an Amazing piece, when posed it resembles a statue more than a figure, i am continually Astonished by Hot Toys, especially this one i grew up watching Predator and i now have him, keep it up!!! My first Sideshow/Hot toys buy. I'd give it a five but was a bit disappointed that the armor and mask didn't have more of a metallic finish like on the sandals. Otherwise it looks amazing, especially the head sculpt. Great figure! 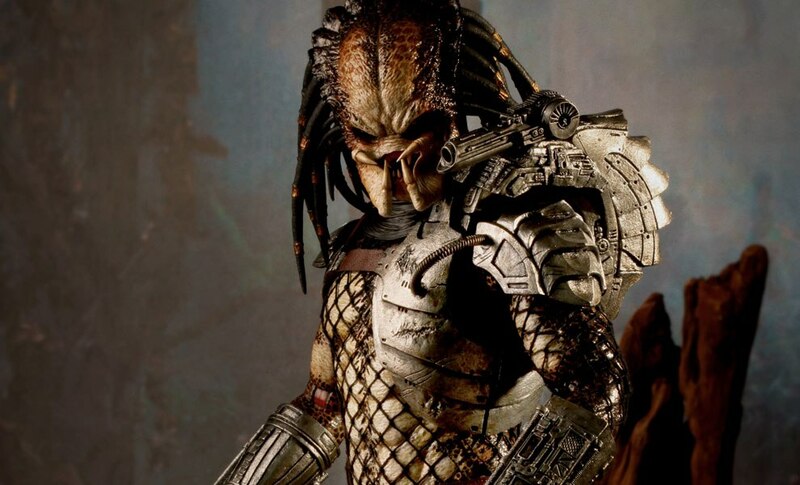 The Predator race has always been one of my top five favorite movie creatures... and this is positively jaw-dropping! I cannot even begin to tell you how excited I am for this. 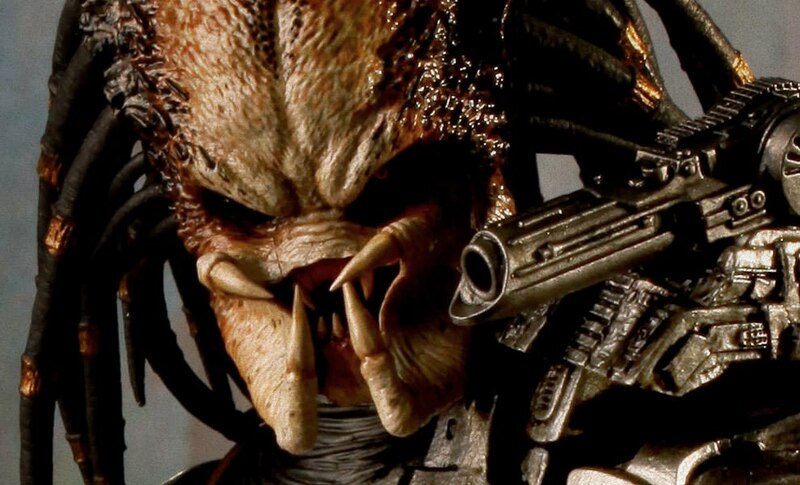 The Predators are so complex and layered in their makeup, and you can never stop looking at them. Just fabulous. 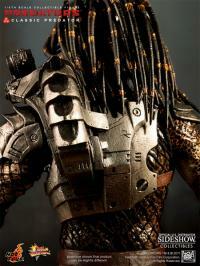 Cant wait to get this. 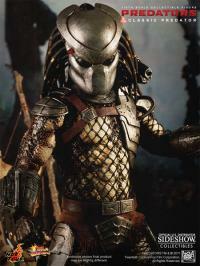 Just wish there was a bloody head sculpt so I could set up a pre beheading scene with my berserker. THIS ONE IS SWEET AND A NO BRAINER GRAB ONE IF YOU CAN. 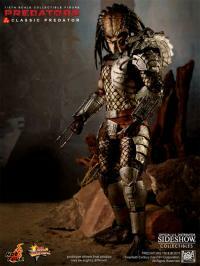 THIS IS ONE OF THE BEST HOT TOY PREDATORS TO DATE, GREAT JOB BY HOT TOYS. FINAL DOING PREDATORS WORTHY OF A TRUE PREDATORS FANS COLLECTION, A CLASSIC PREDATOR! 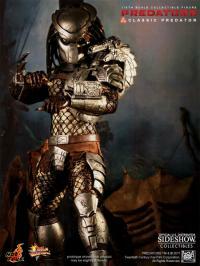 It's about time to introduce new head & body sculpt for the calssic 1987 predator. Don't get me wrong, previous HT classic predator was also a great figure, but this guy beats it by a mile! 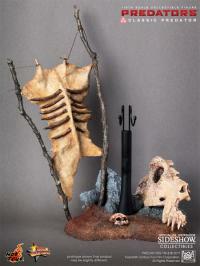 Patience is a virtue and this figure is an award for those who missed out on the first one. This figure is going to be awesome!